4. Blackburn Parish Church = £250. 5. Our Lady of Lourdes Catholic Church Blackburn = £250 . 6. Special Olympics West Lothian = £200 . 7. Make a Wish Foundation Scotland = £500 . 8. Lung Foundation Scotland = £200 . 9. Help the Heroes Scotland = £250 . 13. Whitburn Thistle Boys Football Team Complete set of Team Strips = £297. Brethren: I would like to take this opportunity to thank every freemason, there families and friends for the wonderful effort they have achieved in raising this sum of money and in some small way will go towards helping and making lives a little easier for the less unfortunate. Saturday 10th August 2013 is a day that will go down in Masonic history in Lodge Lord Bruce. The celebration of 50 years in the form of a Rededication Ceremony. After opening the lodge our D.O.C. Bro. 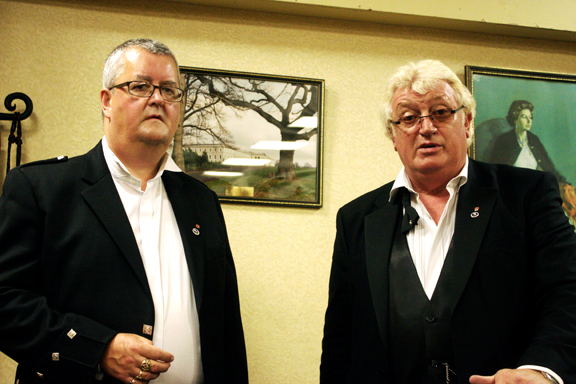 Charlie Rogerson presented two brethren representing our Sponsor Lodges. Representing Lodge St John Crofthead 374 was R.W.M Bro Stevie Savage and representing Lodge Hopebridge Castle 827 Depute Master. Bro. William Vietch. R.W.M. Bro Allan Rennie welcomed both brethren in to the lodge and invited them to take there rightful place in the East. Bro. David Watt D.O.C. 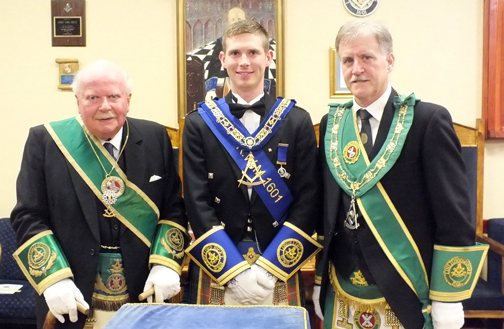 of the Provincial Grand Lodge of Linlithgowshire asked all brethren to be upstanding to receive a deputation from Provincial Grand Lodge of Linlithgowshire headed by Right Worshipful Provincial Grand Master Bro. Robert W. Scott. R.W.M. Bro Allan G Rennie welcomed Bro. Scott in to the lodge and invited him to his rightful place in the East also presented was Bro. James Ellis D.M, Bro. David Rintoul S.M., Bro. Jim Hilditch P.P.G.M., & Bro. Ronnie Gemmill P. G.S. 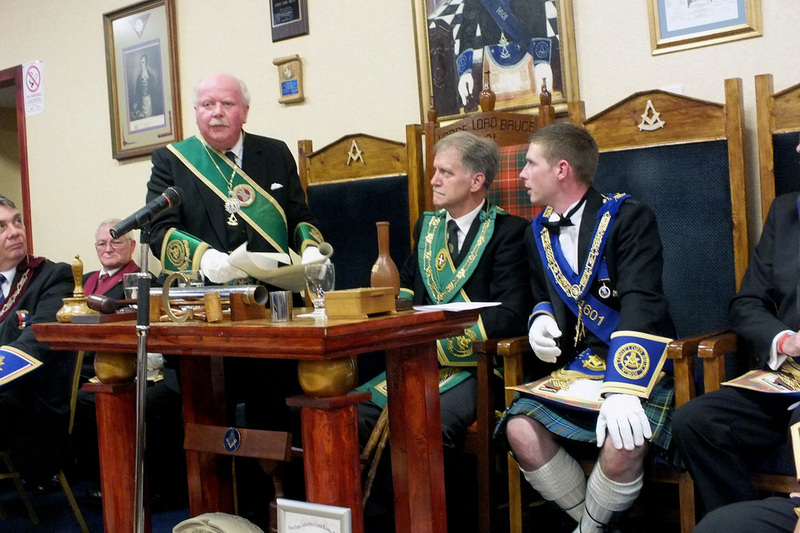 The remainder of the large deputation was welcomed in to the lodge by the R.W.M. R.W.M. Bro. Allan Rennie welcomed the remainder of the deputation Bro. George Preston P.M. 272 H.M. 1601 and Bro. James Robertson P.M. 1186 H.M. 1601 in to the Lodge. Provincial Grand Lodge then accepted the gavel and continued with the 50th Rededication Ceremony in an excellent and dignified manner with new Masonic Regalia, new Working Tools and a 50th Anniversary Plaque all blessed by Bro. Robert Potter P.G. Chaplain. Bro. Robert W. Scott gave a speech at the end of the ceremony congratulating Lodge Lord Bruce on achieving their first 50 years. Before retiring Bro. Lord Elgin gave a humorous and very interesting toast to 1601 and made specific reference to Bro. William Pilmer P.M. F.M. 1601 on his meeting with him to discuss the forming of a new lodge in West Lothian back in 1963. At the close of his speech a rapturous applause was given to Bro Earl of Elgin. behalf of our sponsor lodge. R.W.M. likewise thanked him for the kind gift and accepted on behalf of 1601. Bro. Allan G Rennie then presented a 50th Anniversary Jewel to Bro. Tom Steel W.S.W Lodge St John Stoneyburn 1186 as a thank you for making and presenting a complete set of working tools for all the degrees to be used in the lodge. Queen & Craft Bro Allan G. Rennie R.W.M. Grand Lodge of Scotland & Provincial Grand of Linlithgowshire Bro. Matthew Harvey S.D. P.M. Absent Friends: Founder Members: Tyler's Toast: Bro. Paul Heron W.S.W. P.M.
Bro. Earl of Elgin admires the portrait of Bro. William Pilmer P.M.
At the close of the 50th Anniversary Dinner Paul Heron sang the song " Absent Friends"
Where the hell is Charlie !!!! !